Vietnam's authorities are considering abolishing a 10-year-old decree which allows detention without trial. Critics of the controversial regulation say it is often used to detain opponents of the government. The measure has also been specifically mentioned during the human rights dialogue between Vietnam and the US. The move comes as the US is expected to normalise trade relations with Vietnam ahead of a trip to Hanoi by US President George W Bush. The Vietnamese authorities are "considering and examining possibilities for abolishing this decree and proposing some modifications so that it is adapted to the situation in Vietnam as well as international norms," foreign ministry spokesman Le Dung said. But an official at the US state department said Hanoi's decision to abolish the decree had been conveyed to US Assistant Secretary of State Barry Lowenkron when he was visiting the Vietnamese capital two weeks ago. "Whoever is detained will have to know what they are being detained for and be given an opportunity to go to court and to meet with a lawyer - rights which were not granted before," said Michael Orona, the US state department's deputy director of the Bureau of Democracy, Human Rights and Labour, told the AFP news agency. 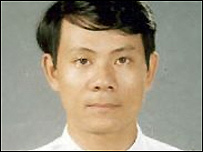 Mr Orona said the Vietnamese authorities had released three "prisoners of concern" since the human rights dialogue was restarted earlier this year, but two still remained in detention. Hanoi has been under pressure to make progress on human rights issues ahead of a vote in the US Congress on a bill normalising trade relations with Vietnam. The vote is expected to take place before 18 November, when Mr Bush is due to visit Hanoi for the Asia-Pacific Economic Co-operation (Apec) summit. Last week Vietnam was given the go-ahead to join the World Trade Organization (WTO) and could be installed as its 150th member by early November. It has been carrying out reforms to bring its laws into line with WTO rules.